Back Row: Dr E. Amis, Professor M. Olvera de la Cruz. Centre Row: Professor H. R. Kricheldorf, Dr J. Steinke, Dr A. Burgess, Professor S. Armes, Professor E. W. Meijer, Professor A. Laschewsky. 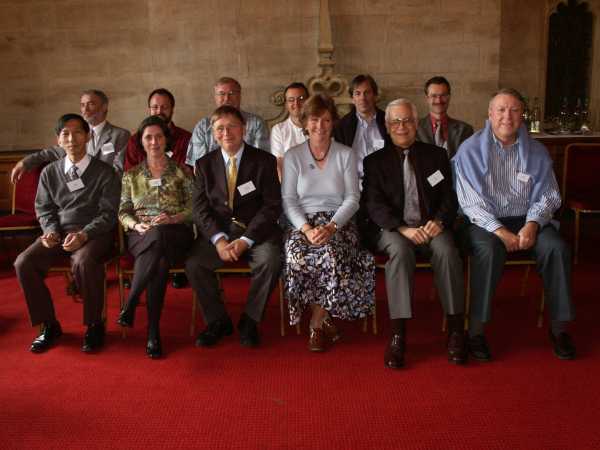 Front Row: Professor M. Doi, Dr V. Arrighi, Professor W. Kaminsky, Professor Dame Julia Higgins (Chairman), Professor E. J. Kramer, Professor E. L. Thomas. "Polymer architectures via cooperative H-bonding"
"Novel alkene polymerisation catalysts and novel polyalkenes"
"The role of cycles in step-growth polymerisation"
"Self-organisation of polymers by electrostatic interactions"
"Water - compatible molecularly imprinted polymers"
"Synthesis of biocompatible phosphorylcholine-based homopolymers and block copolymers via ATRP"
"Polyelectrolyte solutions in multivalent salts"
"Applications of combinatorial methods for investigations of polymer physics"
"Defects and melting of 2D block copolymer single crystals"
"Mechanical properties of ABA tri-block copolymers studied by self-consistent field theory and molecular dynamics calculation"
"Local dynamics of polymers with neutrons: experiments, simulations and theory"
"Rigid or floppy? Hyperbranched and dendritic macromolecules"
"Protein folding, and misfolding: From diseases to devices"
"Human Stratum Corneum - structure and properties"